You can control the way buttons are rendered using the ButtonSettings property. You can change the position of the buttons, align them horizontally and vertically, set their width, height and visibility. Position - controls where the buttons will be placed relative to the listbox. Possible values are Bottom, Left, Right or Top. HorizontalAlign - sets the horizontal alignment of the buttons when their position is either Top or Bottom. Possible values are Center, Left and Right. VerticalAlign - sets the vertical alignment of the buttons when their position is either Left or Right. Possible values are: Bottom, Middle and Top. 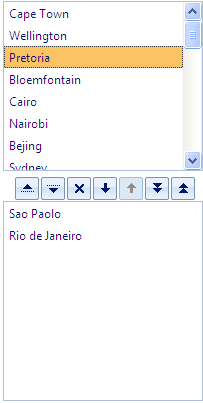 AreaHeight - sets the height of the buttons when their position is either Top or Bottom. Note that AreaHeight value plus the height of the listbox equals the Height property of the RadListBox. AreaWidth - sets the width of the buttons when their position is either Left or Right. Note that AreaWidth value plus the width of the listbox equals the Width property of the RadListBox. RenderButtonText - When set to True (default is False) the text of the buttons is shown as well. To change the text of the buttons please see the Localization article. ShowDelete - when set to False the delete button will not be visible when AllowDelete="True"
ShowReorder -when set to False the reorder buttons will not be visible when AllowReorder="True"
ShowTransfer -when set to False the transfer buttons (move left and move right) will not be visible when AllowTransfer="True"
ShowTransferAll -when set to False the transfer all buttons will not be visible when AllowTransfer="True"